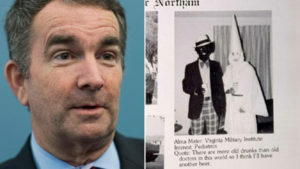 WASHINGTON, DC –A medical school yearbook photo of Virginia Governor Ralph Northam in either blackface or a KKK hood is eliciting calls for his resignation. This comes on the heels of comments Northam made earlier this week about abortion legislation in which he seemed to advocate infanticide. Members of the Project 21 Black leadership network are speaking out against the embattled governor. To schedule an interview with a member of Project 21, contact Judy Kent at (703) 759-0269. Project 21, a leading voice of black conservatives for over 25 years, is sponsored by the National Center for Public Policy Research. Its members have been quoted, interviewed or published over 40,000 times since the program was created in 1992. Contributions to the National Center are tax-deductible and greatly appreciated, and may be earmarked exclusively for the use of Project 21.